RIO DE JANEIRO: Argentina captain Lionel Messi declared on Saturday that he and his team-mates were ready for "the most important match of our lives" against Germany in Sunday's World Cup final. "Tomorrow, we will play the most important match of our lives for our country," the Barcelona superstar wrote on his official Facebook page. "My dreams and my hopes are being fulfilled due to the hard work and sacrifice of a team that has given everything from match one. "We knew it was possible. Our people, the Argentineans, they have carried us here. But the dream is not over yet. Tomorrow we want to win and we are ready!" Argentina will be appearing in their first World Cup final since 1990, when as defending champions a side captained by Diego Maradona lost 1-0 to West Germany in Rome. Argentina won their first World Cup as hosts in 1978, beating the Netherlands 3-1 after extra time in Buenos Aires, before regaining the trophy in 1986 with a 3-2 win against West Germany in Mexico City. 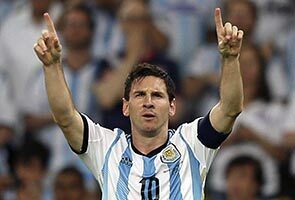 With four goals, Messi is Argentina's top scorer at the World Cup. He has also been named on the shortlist for the Golden Ball, awarded to the tournament's outstanding player.